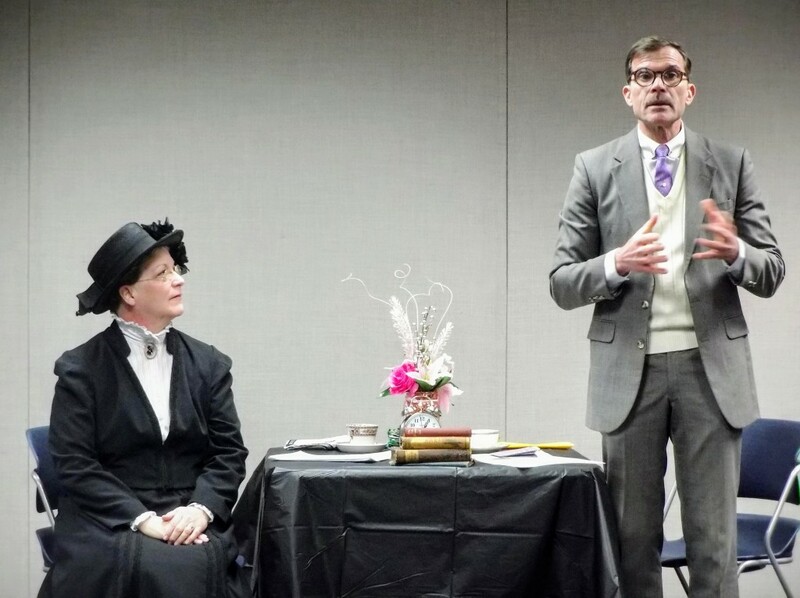 Debbie Weinamker of WeMadeHistory and Alan Gephardt of James A. Garfield National Historic Site as Lucretia and James R. Garfield at Mentor Public Library. We’re fortunate to be neighbors with the James A. Garfield National Historic Site. They lead a monthly a Civil War series at our Main Branch and are a wonderful resource to have nearby. Moreover, the Garfield family has a long history of supporting Mentor Public Library. As part of our 200th anniversary celebration, we invited Lucretia Garfield and James R. Garfield – the wife and son of President James A. Garfield, respectively – to the library to discuss that history. Granted, both Lucretia and James are posthumous. So we did the next best thing and enlisted Debbie Weinmaker of WeMadeHistory to portray Lucretia and Alan Gephardt of Garfield National Historic Site play her son on Saturday at our Main Branch. 1. The Mentor Library pre-existed the Garfield family’s involvement but its whole setup would be odd to us nowadays. In 1819, the Mentor Library Company formed, but its collection of 79 books was only available to shareholders who paid $2.50 per share. The notion of a Mentor Library – free to use for Mentor Township and Mentor Village residents – was the dream of James R. Garfield. Garfield (the son, to be clear) was elected president of the library’s board in 1890, and he served in that role until 1927. In the meantime, he was involved in state and national politics and served as Secretary of the Interior during Theodore Roosevelt’s administration. 2. Before the library had its own building, it was housed in Mentor Village Hall. The Garfield family wanted the library to have a home of its own – complete with a reading room. The most lucrative entertainment was a melodrama starring Mary “Mollie” Garfield and entitled “The Sleeping Car.” It raised $107.15. They raised another $11 by auctioning a cake. James R. Garfield had the winning bid, but he had to borrow $10 because he only had a dollar in his pocket at the time. 3. In May of 1895, the Mentor Village Council raised a half-mill levy to support the library. It provided the library with $160 a year, rendering the entertainments superfluous and paving the way for Mentor Library’s first building. The architect was, naturally, another member of the Garfield clan. Abram Garfield, Lucretia’s son and James R. Garfield’s brother, designed the building in the New England style. The land was purchased from a Dr. Lester Luse for $2,200. When both land and building were totaled, the new building cost $7,693. At the time, it stood at the corner of Mentor Avenue and Center Street. This first library building still exists, by the way. However, we no longer own it and it serves a different purpose now. 4. In 1926, toward the end of his tenure as board president, the library was renamed in honor of James R. Garfield. The rebranding only lasted 24 years and the Garfield Public Library was renamed again in 1950. (This time, it became Mentor Public Library and the name’s stuck thus far.) But we still commemorate James R. Garfield and his contribution to the library. One of the meeting rooms in our Main Branch is named in his honor. 5. The Garfield family was immensely literate. President James A. Garfield understood both Greek and Latin and was rumored to be able to write both simultaneously. He especially enjoyed poetry by Alfred Tennyson and William Wordsworth and, as a child, had a fondness for books about pirates. He and Lucretia would read to the children around the parlor table from Lamb’s Shakespeare and One Thousand and One Arabian Nights. They would often quiz their children’s spelling, using 7,000 Words Often Mispronounced in the English Language. As for the son, James R. Garfield enjoyed the outdoors and spent what little free time he had fishing, hunting and playing tennis. But he still had a predilection for William Makepeace Thackeray and Charles Dickens novels as an adult. Click here for more information on Mentor Public Library’s history and here for more on our year-long celebration of our 200th anniversary. This entry was posted in Uncategorized and tagged Cleveland history, history, James A. Garfield, James A. Garfield National Historic Site, James Garfield, Lucretia Garfield, Mentor, We Made History. Bookmark the permalink.